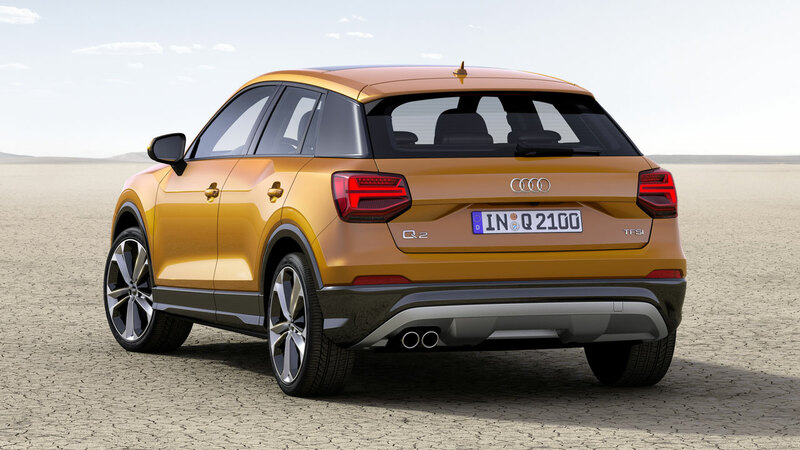 Different strokes have defined a sharp and progressive new look for the new Audi Q2, the fourth member of the highly successful Audi Q family which makes its world public debut at the 2016 Geneva Motor Show. Head of Audi Design Marc Lichte and his team have taken the compact SUV in a bold new styling direction designed to appeal to a younger audience, and have combined this with a quality of finish and a portfolio of connectivity, infotainment and assistance systems that will be instantly familiar from the larger Audi models. “In the Audi Q2 we have developed a distinctively geometric form language with model-specific design characteristics. The car exhibits an independent character within the Q family,” says Lichte. The result: a powerful SUV that shows a lot of vertices and edges. At the front, a strong image is created by the high-mounted Singleframe grille in octagonal design as well as the large air inlets. Especially eye-catching is the low roof that descends and merges into the C-pillars with colour offset blades. The rear body terminates in a dynamic way with a long roof spoiler and a diffuser that has an underbody-protection look. In profile, the high shoulder line is especially eye-catching as are the concave flanks in the door area. 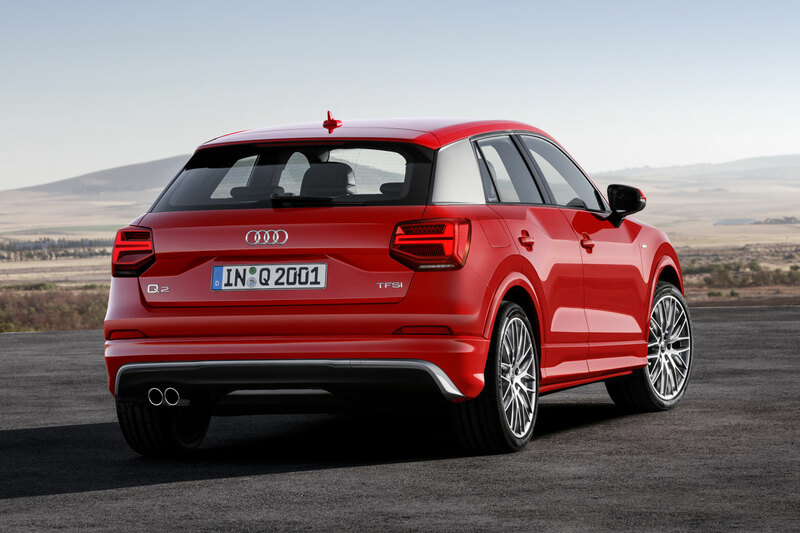 The latter emphasise the wheel housings and thereby the quattro character of the compact SUV. The vehicle measures 1.51 metres tall and 1.79 metres wide. The overhangs are short with a vehicle length of 4.19 metres and a wheelbase of 2.60 metres. 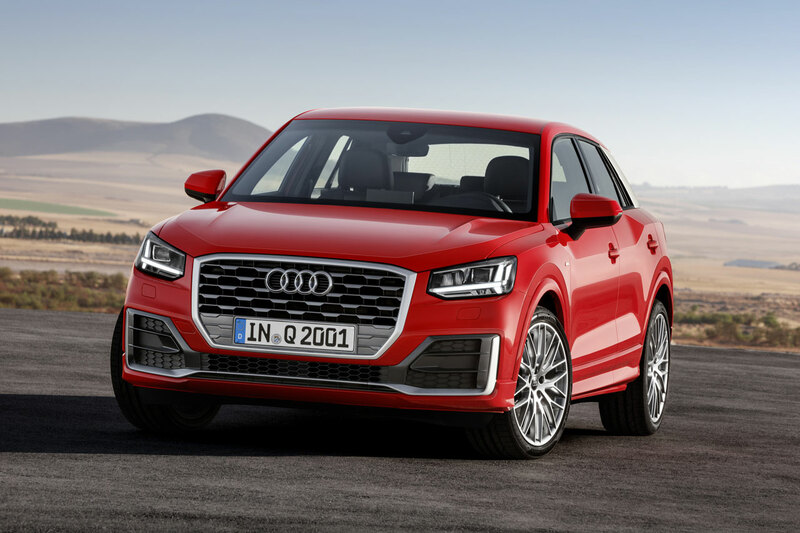 Along with the optional Audi virtual cockpit and the head-up display, the driver assistance systems for the Audi Q2 also come from the larger Audi models – including the Audi pre sense front that is standard. The system recognises critical situations with other vehicles as well as pedestrians crossing in front of the vehicle, and if necessary it can initiate hard braking – to a standstill at low speeds. Other systems in the line-up: adaptive cruise control with Stop & Go function, traffic jam assist, the lane-departure warning system Audi side assist, the lane-keeping assistant Audi active lane assist, traffic sign recognition and rear cross-traffic assist. The Q2 is equipped with a standard MMI screen that is positioned high on the instrument panel. The infotainment system can be operated by a rotary/push-button control and two buttons on the centre tunnel. When MMI navigation plus with MMI touch is ordered, the user also gets a touchpad on the central control element. In addition, the system can be conveniently controlled by natural language operation and the integrated MMI search. A Wi-Fi hotspot enables surfing and streaming with mobile end devices. Furthermore, customers can use MMI touch to query the online services of Audi connect. The flat rate data plan required for this is included thanks to the SIM card (embedded SIM) that is permanently installed in the car. It also permits roaming in most European countries. Cell phones with iOS and Android operating systems are integrated into the car via the Audi smartphone interface. The free Audi MMI connect app enables online media streaming and transfer of a calendar from a smartphone to the MMI. The app for iOS operating systems also has the myAudi destinations function. It makes it possible to send the data of a desired navigation destination from any app to the MMI navigation plus system. The system then uses it for navigation. 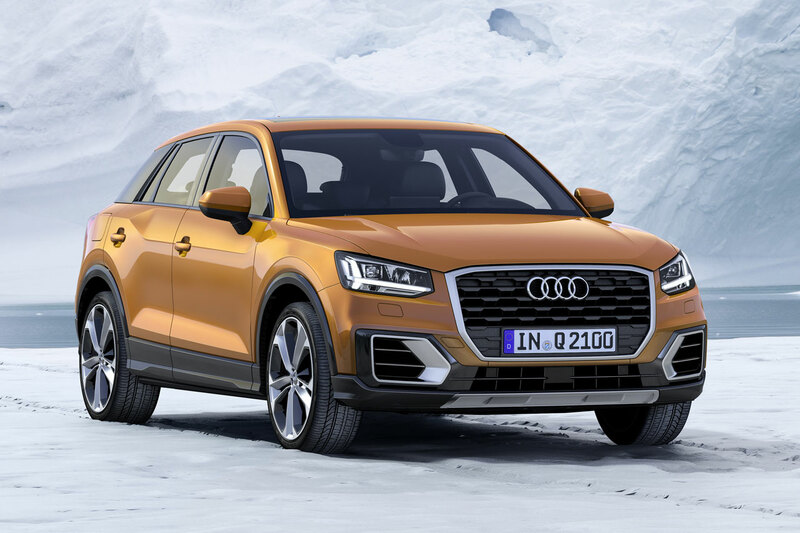 The Q2 fulfils the fundamental expectations of an SUV with a high entry, good visibility and a large luggage compartment (405 to 1,050 litres of capacity), yet the driver’s seat position is low in relation to the steering wheel as in an Audi saloon. Optional practical solutions are available such as a power tailgate and a three-way split rear bench backrest with cargo through-loading. 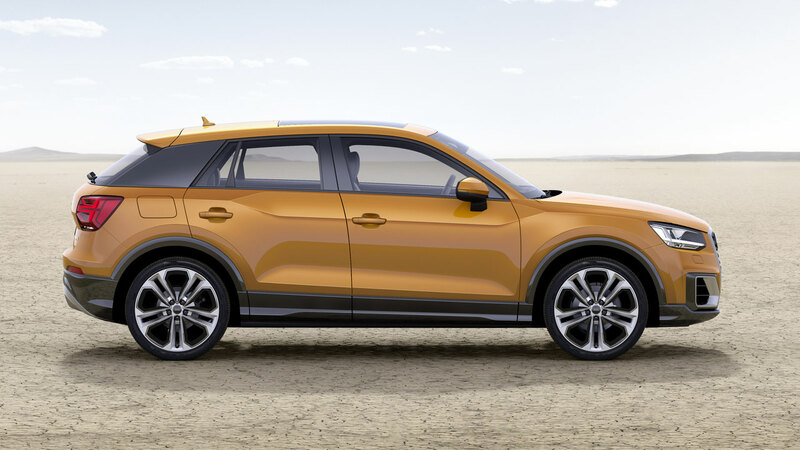 The Audi Q2 is as individual as its drivers – inside and out. 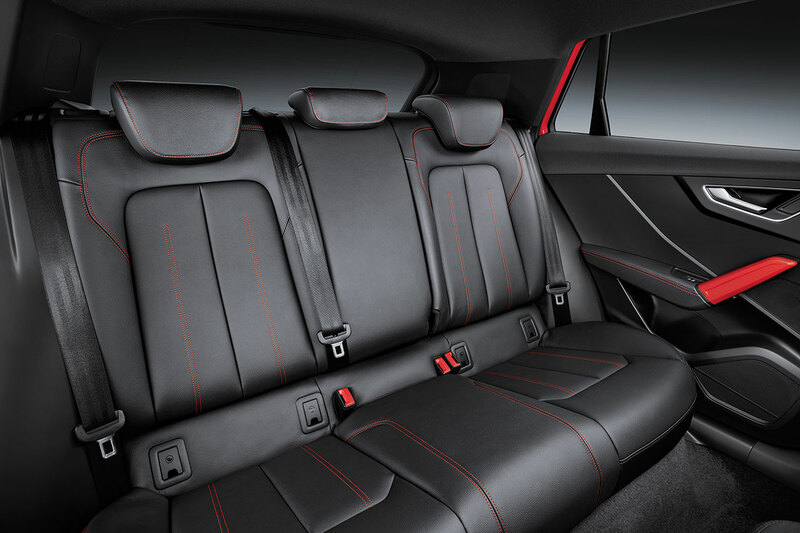 Many equipment packages, exterior colours and expressive colours for interior trim and seat upholstery allow plenty of creative space for personal configuration. One option is the LED lighting package, in which the interior is staged in a particularly attractive way with illuminated trim elements. Newly designed 17-inch alloy wheels are fitted as standard, and can be optionally increased to 19 inches upon request. The Q2 is launching in the UK with a selection of five different engines. Along with a 1.0-litre three-cylinder TFSI, two four-cylinder petrol engines are being offered with 1.4 and 2.0 litres of displacement (2.0-litre TFSI to follow in 2017). In addition, two four-cylinder diesel engines will be available with 1.6 and 2.0 litres of displacement and outputs of 116PS and 150PS. As an alternative to the six-speed manual transmission, Audi also offers the S tronic dual clutch transmission with seven speeds for all engines. In the 2.0 TFSI, a newly developed dual-clutch transmission is used which has a new type of oil supply and reduced friction. The 150PS TDI engine can be combined with quattro permanent all-wheel drive, and the system is standard in conjunction with the 2.0 TFSI engine. 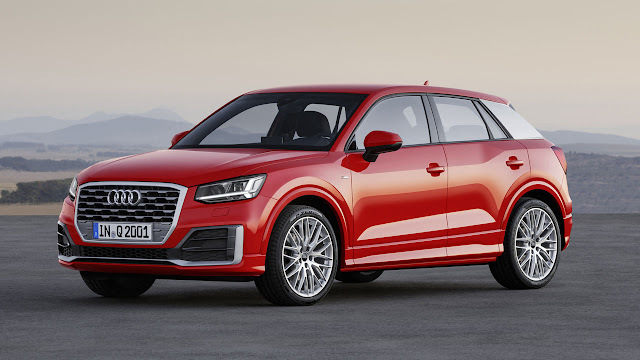 Installed at the rear on the front-wheel drive versions is a semi-independent suspension, while the quattro models have a four-link suspension. Progressive steering is standard in all versions. It varies the steering gear ratio as a function of the steering input; the ratio is made more direct with large steering movements. Adaptive dampers are available as an option, as is the Audi drive select system with which drivers can set an individual characteristic for their Q2.